What IS IT about a game of BINGO that just makes kids go wild? No matter the age or time of year, if you pull out a BINGO game you are sure to generate a lot of fun and enthusiasm. I've used BINGO games as review games when I was a Classical Conversations tutor. I've also used them with my own children in our homeschool when we would have a day that just needed some fun inserted in it. This Valentine Bingo will be the perfect addition to your February activities - or even good for a Valentine party. Add the game to one of the 16 Sweet and Simple Valentine Activities and you're good to go! Or, how about some Valentine books - with a super cute Valentine idea and printable to go with them? The best reason is being able to sneak a few more memories into our children's memory banks. You can even sneak a little homeschooling in between the Valentine and candy swapping. In order to increase the fun factor and minimize the schooling factor, keep it sweet and simple with these fun activities. Little hands and chubby fingers brand new to holding crayons need simple activities. They crave hands-on type fun. Getting messy might be at the top of their list. Move beyond coloring pages and busy worksheets. Try out some of these simple activities that are sure to bring out sweet smiles and giggles. Pom Pom Painting - Pom poms, clothespin, paint, and a fun printable and you're set. Shaving Cream Painting - Little hands can get as messy as you're willing with this super fun yet contained painting craft. Valentine Station - Set up a fun assembly line of valentine art making for little ones. Candy Heart Play Dough - Pair sight word learning with play dough for a memory-making schoolish activity. Mend a Broken Heart - less messy and a gentle way to share a visual of a broken heart. You could include a Bible verse about God's healing a broken heart to guide you. Once our younger children are old enough to hold a pencil correctly and have moved on to reading, the complexity of craft making changes. But, not the fun! The simple part of these activities can be found in the simple but sweet treats they create with little help in the kitchen, or the joy found in a game or Valentine given. Oven Bake Pinch Pots - Clay and glitter create a treasure to keep or gift to give. Mini Bubble Gum Machine- Bright and colorful and made with bubble gum. This low-cost fun activity makes a fun Valentine to share. Minute to Win It Games - Create an atmosphere of fun and giggles with these quick-paced games that have an added bonus of burning of the sugar from the sweet treats. Heart-Shaped Rice Krispie Treats - No heat needed if you use the premade pan sized version. Cookie cutters, candy melts, and sprinkles are the sweet, simple ingredients. It might be tempting to think that our children have outgrown the bit of fun that Valentine's Day affords in the middle of winter. Not true! Don't be afraid to revert back to the homeschool crafty mom. Your teens will love sharing time with the family with dedicated crafts and treats especially for them. Washi Tape Hearts- Even the angstiest of teens will get join in this activity. They might even surprise you with one as a Valentine. First Corinthians 13 Bible Study- Use the Valentine's Day holiday to share the true meaning of love. Valentine's Day Unit Study - Learn about St. Valentine. Yarn Wrapped Hearts - These are just plain fun. You can add a string and hang them. Add a magnet and pop them on your fridge or locker. So many possibilities! 40 Fun Valentine's Day Crafts for Older Kids - This epic post rounds-up all things fun and simple for middle school and older. We notebook across all subjects, holidays, and more. Notebooking Pages has FREE Valentine pages - feel free to grab them and let your children get creative while learning! 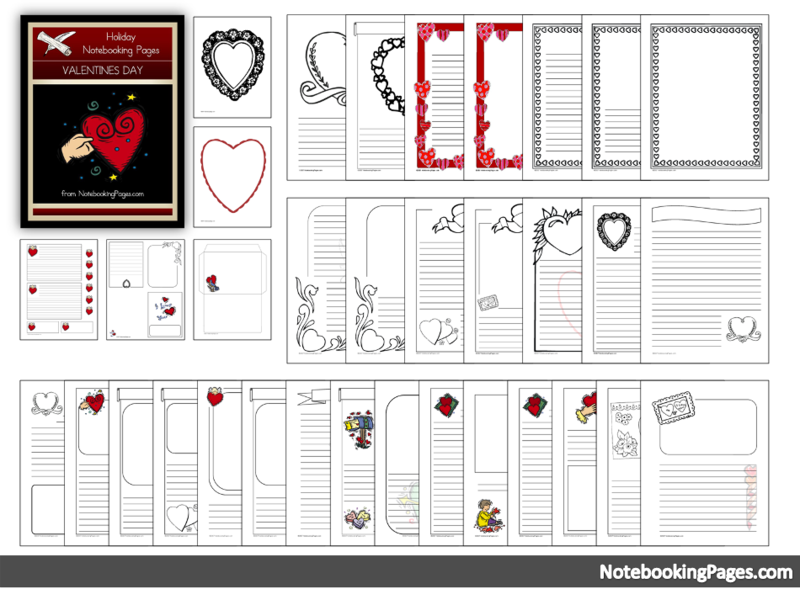 Free Valentine's Day Notebooking Pages from NotebookingPages.com. It wouldn't be Valentine's Day without giving a Valentine! Here's one for you. With a little planning, perspective, and an eye on fun you can create a memorable Valentine’s Day for your entire family.